I am using Python osgeo/gdal library to access Landsat 7 data (from different bands) as a numpy array. When looking at the data, I often see a very prominent comb-like banding effect. 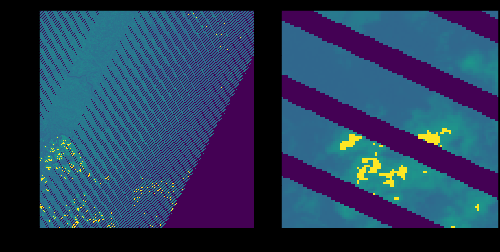 The image below shows a example and a bit of zoomed in detail as displayed by matplotlib. I see the same effect if I simply look at the image with an image viewer. Is this normal, or am I reading the data wrong somehow? And if it is an artifact of the data, is there a standard way of "fixing" it? I think what you are seeing is the error which came about from the Landsat 7 Sensor when the Scan Line Corrector (SLC) failed in 2003. Basically all imagery collected by Landsat 7 post 31 May 2003 has these artifacts in the images collected. Following some of the links there are ways to correct this. There is also a "Gap masks" which allow for the identification of those areas where data is missing. The link above describes the methodologies used to determine if a scene is salvageable. If it is, you can combine scenes to fill the gaps where data is missing. Will assist in identifying which scenes are best to use. As an aside, if you look on the right hand side of this question you will see a number of similar questions relating to the Landsat 7 SLC failure. These links will also give you insights into how best to handle the error. Not the answer you're looking for? Browse other questions tagged gdal landsat-7 or ask your own question.